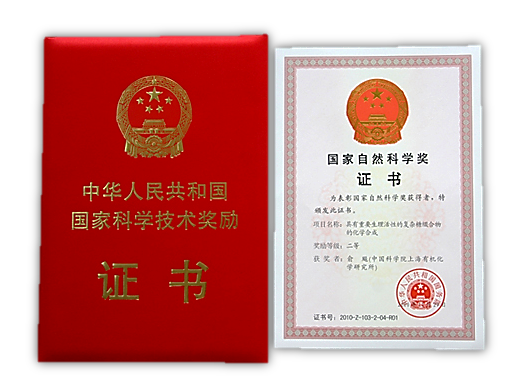 On January 14, 2011, the 2010 State Science and Technology Awards Convention was held at the People’s Great Hall, Beijing. 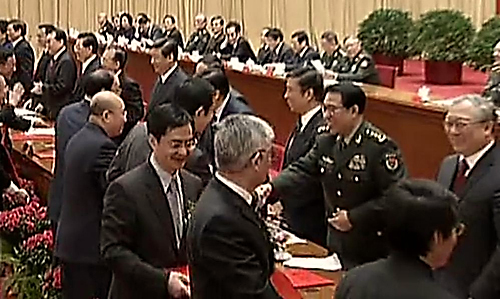 China’s top leaders including President Hu Jintao, Premier Wen Jiabao and prominent scientists attended the gathering. Yu Biao and his colleagues Hui Yong-Zheng, Wang Lai-Xi, Deng Shao-Jiang and Lu Shou-Fu won the second-class State Award for Natural Sciences for their contribution to the “Chemical Synthesis of Complex Glycoconjugates of Biological Significance”. Yu attended the ceremony on behalf of his research team. China has presented the State Scientific and Technological Awards to its elite scientists and researchers for 11 consecutive years since 2000. The State Awards include the top Science and Technology Award, the State Award for Natural Sciences, the State Award for Technological Innovation, the State Award for Advancement of Technology, and the State Award for International Science and Technology Cooperation, honoring those who have made major breakthroughs in the frontiers of contemporary sciences and technologies; outstanding contributions to push both fields forward; or those who created tremendous economic or social benefits through scientific and technological innovations, transfer of scientific and technological achievements, and industrialization of high technologies. Materials expert Shi Changxu and hematologist Wang Zhenyi won the annual State Top Scientific and Technological Award for their outstanding contributions to scientific and technological innovation in this year, and 30 other projects were named as second-prize winners in the State Natural Sciences Award category.